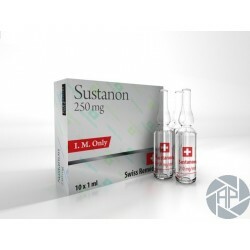 Sustanon is a very popular steroid. Users will be highly valued, as compared with other drugs the testosterone offers several advantages. It is a mixture of four different testosterone that is based on the well-coordinated composition exhibits a synergistic effect. The effect of four testosterone supplements in time, so that Sustanon starts to act very quickly and remains active in the body for several weeks. Thanks also contained Sustanon propionate unfolds its effect within a day and decanoate provide a three- to four-week activity. Sustanon has a distinct androgenic effect which is coupled with a strong anabolic component. Sustanon suppresses the endogenous testosterone production. Among women not receiving testosterone depot recommended because it greatly increases the level of androgens and the result could be virilising symptoms. SUSTANON is similar to testosterone enanthate only occur less frequently, respectively. Not so much. With regard to individual requirements and dosage, the user can register normal androgenic side effects such as acne, aggressiveness, excessive sexual stimulation, oily skin, increased hair loss, and reduced its own production of hormones. Water retention and gynecomastia in Sustanon "keep within reasonable limits", respectively. not so frequent and pronounced as with enanthate and cypionate. Liver damage is unlikely, at very high dosages, however, may increase liver values after stopping a preparation normally themselves normalized.